Yes, the practice of medicine is challenging today. Doctors of course are part of the problem. They made themselves the cog in the wheel when they never addressed their lack of productivity. Doctors today still complain they don’t have enough time with patients. The latest misdirection is computerization to increase productivity, but that is just a ruse by government and insurance companies to tap into patient data, not improve patient care. Computerization isn’t an answer to what ails modern medicine when the computer monitor gets all the quality time and eye contact, not the patient. Some wise doctors figured this out and utilize ancillary personnel to measure height and weight, to measure blood pressure and write down the patient’s chief-complaint and enter findings and prescriptions in the patients’ chart so doctors have more focused time to assess, diagnose and prescribe. The doctors who insist upon penning their own charts in longhand will see no more than 20-30 patients a day. A doctor with scribes and medical assistants can see 80-100 patients a day and the patients will not feel like they have been put through a patient- mill. Use scribes and the problem of a doctor shortage is solved. [MedScape.com Feb 27, 2014] All professions face the challenge of being more productive without burning out. Inflation alone demands that. Our dissatisfied doctor and all new medical school graduates need to read Dr. Robert S. Mendelsohn’s book Confessions Of A Medical Heretic (1979 Contemporary Books, Amazon.com). Dr. Mendelsohn came to these and other realizations and lambasted the practice of medicine over thirty years ago. Ah, yes, our modern-day doctor says he and his colleagues should take some of the credit for greater life expectancy of Americans achieved by broadened vaccination programs and heart-lung bypass operations, he says. But US life expectancy rose largely from declining rates of infant mortality, not by adding years to the end of life with heart bypass operations. [LiveScience.com Aug 21, 2009] The volume of heart bypass operations has dropped over the past decade so any decline in mortality rates for coronary heart disease can’t possibly be attributed to these surgical procedures. [WebMD.com May 3, 2011] Vaccination programs have reached a point of diminishing returns till there are more vaccine-induced cases of polio than there are natural cases. [KnowledgeofHealth.com March 11, 2014] Our dissatisfied doctor only sees medical progress with more doctors, not less. The doctor writing in the WSJ says less and less money is actually going to people who provide the care. Yes, gone are the days when the patient paid for 20% of their care, the doctor received 80% of his fee from the insurance company and the insurer realized about 2% profit. Today the insurance companies own clinics, put doctors on salary and take the 80% for themselves. That isn’t going to change. A primary reason why third parties have been cut into the insurance reimbursement scheme is that physicians have not been able to police their own ranks. Large numbers of needless treatments and deaths have been reported since the 1970s when HMOs (health maintenance organizations) were brought in to reduce overtreatment. But all that happened is that HMOs grabbed a piece of the reimbursement pie while the unnecessary care continued. The C-section rate is still greater than a third of all births and baby deliveries are now pre-planned for the convenience and financial reward of the doctor. [MedScape.com] For comparison, the C-section rate in Japan is almost half that of the U.S. (17.4). [World Health Organization] Furthermore any competition posed by midwives is mischaracterized as a safety problem by obstetric doctors. The greatest increase in health care spending between 2001 and 2011 was attributed to new blockbuster drugs, medical devices and hospital care, representing 80% of annual healthcare expenditures while only 3% was spent on health and disease prevention. [Journal American Medical Assn. Aug 2014] Even then, many of the so-called preventive colonoscopies and mammograms are ordered just to drum up more surgeries to perform, not to prevent disease from occurring in the first place. The problem is that doctors are going to perform the procedures that provide the greatest financial reward. If a more economical treatment becomes available, will doctors ever usher in more cost-effective therapies? There are only six published studies on the relationship of vitamin D to tonsillitis [Pubmed.gov] yet vitamin D was discovered over 90 years ago. The Healthcare Bluebook shows the physician’s fee for a 30-minute tonsillectomy is ~$568. [HealthCareBlueBook.com] Vitamin D pills cost ~10-cents and don’t even require a doctor’s office visit to obtain a prescription. Around 50% of the half-million tonsillectomies performed annually are deemed to be unnecessary. Probably the majority of tonsillectomies are needless if kids regularly took vitamin D pills. But will doctors cut themselves out of the insurance pie and begin to prescribe vitamin D? The problem is most doctors don’t see themselves as vitamin pill prescribers. They didn’t go to medical school for that. Patients who are prescribed vitamins don’t need to come back to the doctor’s office to renew prescriptions. Doctors lose drug consultation fees. The doctor writing in The Wall Street Journal says the current fee-for-service system needs to be replaced with bundled care (fees are divided among doctors to care for a patient) or pay-for-performance, which suggests doctors get paid more if the patient gets well and is discharged from the hospital earlier. The problem is, the very idea of true prevention where disease and treatment is not needed at all is beyond what this doctor and his colleagues are thinking. The doctors have circled the wagons. They are in the income protection mode. Health authorities say investment in prevention should be a national priority given that Medicare faces eventual insolvency. [Journal American Medical Assn. Aug 2014] Go ahead and see if you can get doctors to buy into prevention when it reduces their income. Physician groups have relinquished their role as protectors of patients by selling their souls out for free pizza lunches, free scratch pads and speaker fees for slide shows delivered to physician audiences at beachside resorts. Our dissatisfied doctor just happens to be the director of a heart failure program in New York. So it is timely to review the latest hoopla over a new heart failure drug. The combination drug known as LCZ696 (enalapril ACE inhibitor + neprilysin inhibitor) is being heralded as the first advancement in drug therapy for heart failure in many years. 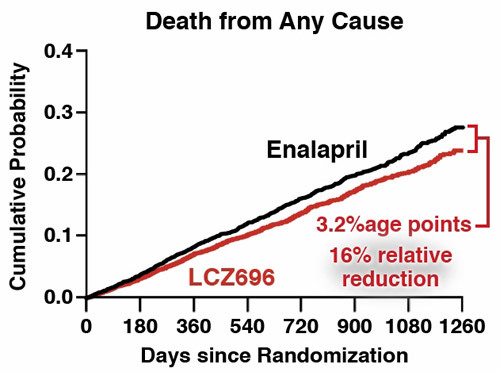 A so-called landmark study shows LCZ696 cuts the risk of death from cardiovascular causes by 21%, reduces heart failure hospitalization by 21% and reduces risk of mortality from all causes by 16% when compared to enalapril alone. But these are relative numbers. The absolute risk reduction is 3.2% and 32 heart failure patients have to take LCZ696 to save one life over a 5-year period. Larry Husten, a medical journalist known to pen positive news about Big Pharma’s latest advances in cardiology, says the results achieved with LCZ696 are “so good it’s boring.” [Forbes.com Aug 30, 2014] MedPageToday.com called LCZ696’s the 3.2% absolute risk reduction for death or hospitalization “a game changer.” Yet examine the chart below and the two lines, one for enalapril alone and the other for LCZ696, and the two drugs don’t appear to be much different. Around 50% of patients with heart failure succumb to this disease within 5 years of a diagnosis. [Circulation Jan 21, 2014] In hard numbers LCZ696 cuts that risk by 3.2% still leaving the vast majority of patients who die of the disease with no benefit, and it’s hailed as a blockbuster. Wall Street is cheering, are the patients? Let’s compare LCZ696 against vitamin D, a nutrient that is finally receiving attention for its ability to quell heart failure after ninety years in the therapeutic closet. A small study of 23 chronic heart disease patients shows 4000 IU of vitamin D/day for six months improves heart-pumping action. [Nutrition Metabolism Cardiovascular Disease Aug 2014] In other words, it partially reverses heart failure. Vitamin D appears to work demonstrably better than LCZ696 and receives no headlines. Will our dissatisfied doctor be convinced enough to begin testing his heart failure patients for vitamin D and prescribe this common vitamin? Don’t bet on it. Clearly doctors and patients are on different paths. As an old saying goes, you can lead a horse to water but you can’t make him drink. Doctors want to practice medicine on their terms. Increasingly dissatisfied doctors and more and more disenchanted patients. Gone are the days when patients and their families stood up when a doctor entered the exam room. The problem is that doctors still control the hapless patients. And as long as somebody else is paying the bill, it appears too many patients like all this doctoring and needless care. A number of years ago I began to experience symptoms – indigestion, knife-like pain under my lower right rib – consistent with gallstones. I began to research the problem and realized these symptoms often emanated from thick bile. Calcium or cholesterol stones can block the duct from the gall bladder that is a squirt-gun for bile and the symptoms arise. I learned that taurine, an amino acid, taken along with an iron chelator (key-lay-tor) derived from rice bran thins the bile and dissolves the stones. If I had gone to a doctor I would have been referred to a surgeon to remove my gall bladder. That is the standard course of action. I’ve still got my gall bladder and the symptoms of pain and indigestion have subsided. In recent times, facing a rather stressful situation in my life, I developed chest pain running from my neck on down during periods of physical exertion or emotional stress. A visit to a cardiologist and a stress cardiogram on a treadmill prompted the doctor to refer me to a specialist who does angiograms and places stents in coronary arteries. But I wasn’t having classic angina. I later realized the chest pain I was having emanated from difficulty exhaling air from my lungs in what turned out to be exercise/stress induced asthma. I took some licorice root to boost my adrenals and the problem vanished. I never attended the appointment with the stent-happy doctor. The point is, if I had followed the advice of doctors I’d be minus a gall bladder and have a huge scar across my belly to show for it and I’d be nursing a stent with blood thinners hoping it wouldn’t collapse or cause a blood clot itself in a coronary artery. Our outspoken doctor says he “believes most doctors continue to want to be like the physician knights of the golden age of medicine.” Yet most doctors have traded their role as patient guardians and allowed commercial interests to prevail. I know some very brave knights of medicine like Dr. Ron Hoffman in New York City [IntelligentMedicine.com], Dr. Ron Rothenberg with Scripps Institute in San Diego [California Healthspan Institute], Dr. Tom Levy, cardiologist and author of many health books [YouTube], Drs. Nate Lebowitz and Jackie Hollywood who practice true preventive cardiology in Ft. Lee, New Jersey [Advanced Cardiology Institute], Dr. Stuart Richer with the North Chicago Veterans Hospital eye clinic [EyeDoctorRicher.com], Dr. Steven Gundry, cardiac surgeon in Palm Springs, California [International Heart Lung Institute]. These doctors are helping their patients step around the land mines of modern medicine, not helping them bow to it. The ethics of modern medicine should be to put itself out of business. Those doctors who use this as their compass will have no problem finding satisfaction in the practice of medicine. There will be long lines of new patients outside their offices clamoring to get in. The doctor writing in The Wall Street Journal says he is sick of his profession. He should be disgusted with it. – ©2014 Bill Sardi, Knowledge of Health, Inc.